Brain glycogen provides fuel for neuronal and astrocyte functions. It is critical for high cognitive processes including learning and memory consolidation. We report the first crystal structure of human brain glycogen phosphorylase. Our study support that the distinct structural and regulatory properties of glycogen phosphorylase isozymes contribute to the different functions of muscle, liver, and brain glycogen. 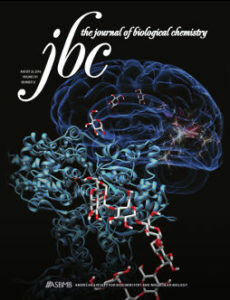 Mathieu C, Li de la Sierra-Gallay I, Duval R, Xu X, Cocaign A, Léger T, Woffendin G, Camadro JM, Etchebest C, Haouz A, Dupret JM, Rodrigues-Lima F. Insights into Brain Glycogen Metabolism: THE STRUCTURE OF HUMAN BRAIN GLYCOGEN PHOSPHORYLASE. J Biol Chem. 2016 Aug 26;291(35).